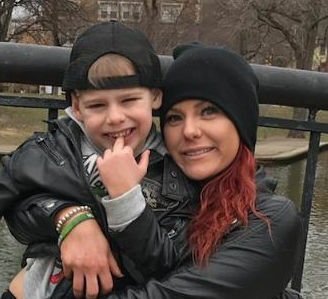 Courtney Leigh Shook, 29, of Jamestown, lost her struggle with addiction on Friday, April 12, 2019, and God called her home. She was born January 21, 1990 in Meadville, a daughter of Terry and Debbie Calvin Shook. Courtney was a 2008 graduate of Jamestown High School and received her Esthetician certificate from the Aveda School in Boardman, OH in 2016. Most recently, she worked as the bar manager at the Hotel Conneaut, a job she loved. She was previously employed at Russells Restaurant in Linesville. Courtney had a smile that could light up a room, and an infectious laugh. She never met a stranger. Most recently, while in recovery, she was residing in sober living in Pittsburgh and looking forward to getting her life back on track. Her son, Channing was her whole life. She did not have the opportunity to work in the Esthetician field, but was looking forward to entering that field, as in her words, so she could help women “look as beautiful on the outside as they were on the inside.” She had so, so many friends and patrons that she loved from the Hotel Conneaut. She loved Conneaut Lake, and spent many happy times on the late, either boating or at the beach with her son. She was an amazing kind, giving soul, who always had a special place in her heart for those also struggling with addiction. She was a loving, thoughtful daughter, even when immersed in addiction, and was always so thankful and appreciative for her parents never ending love and support. She had a strong faith in Christ, and knew that He carried her thru some very difficult times. She had told her parents that there were dark times in her addiction where there was no other reason she survived, other than God’s mercy and saving grace. While she had a tumultuous relationship with Channing’s dad, Nick Hucke, and on many occasions didn’t like him very much, she always loved him in her heart, and wanted the best for him. Courtney was affiliated with Bethel New Church in Greenville and had attended Celebrate Recovery there. Survivors include her parents, Terry and Debbie Shook of Jamestown; the love of her life, her son, Channing (Chanimal) Hucke at home; a sister, Carrie Shook and her companion Al of Albuquerque, NM; her former fiancé and father of Channing, Nick Hucke of Espyville and her extended loving Hucke family; dear friend, Hollee Fry; and numerous aunts, uncles, and cousins including her cousin, Natalie Gilson of Lebanon, PA with whom Courtney had a special bond. She was preceded in death by her maternal grandparents, Virgil and Irene (Mimi) Calvin; paternal grandparents, Harold and Luella Cooper; and dear friend, “Zim”, Brandon Zimmer. Services are private at WAID-COLEMAN FUNERAL HOME, 12422 CONNEAUT LAKE RD., CONNEAUT LAKE. A Celebration of Courtney’s Life will be held at a future date and time to be announced.